In the latest celebrity break-up news, Demi Lovato has called it quits with fashion designer Henri Levy, according to UsMagazine.com. Both sober, the two met years ago in rehab and became friends. They sparked news of their celebrity relationship after they were spotted in early November 2018 enjoying a dinner date at Matsuhisa restaurant in Beverly Hills. Neither has commented on their split. This celebrity break-up comes after only four months of dating. What are some ways to know your relationship has long-term potential? In celebrity news, Demi Lovato was seen kissing clothing designer Henry Levy this past weekend. The rumored celebrity couple was out to dinner after the singer received a Grammy nomination for Best Pop Duo/Group Performance. According to UsMagazine.com, Lovato was first spotted with Levy in the beginning of November after completing her time in rehab. The clothing designer has also spent time in rehab previously. While Lovato’s romance is fairly new, her main focus is recovery. Things are heating up for this new celebrity couple! What are some ways to know when to take your relationship to the next level? Demi Lovato has always been vocal about her feelings toward her ex boyfriend Wilmer Valderrama. The celebrity exes previously dated for six years before their celebrity break-up in 2016. However, the pair made celebrity news a couple days ago, after they were spotted grabbing lunch together Now, a source close to the former couple tells People.com that there is a chance they could become exclusive again. For now, though, the source says Valderrama and Lovato are “extremely close friends” though “there’s always potential they could give a romantic relationship another try.” Guess it is possible to be friends with an ex, after all! These celebrity exes are on good terms, and may end up back together. What are some reasons getting back together may actually work out? In celebrity news, celebrity exes Demi Lovato and Wilmer Valderrama were spotted having a lunch date at Sol Y Luna in Los Angeles, according to UsMagazine.com. The former celebrity couple dated for six years, and their celebrity break-up occurred in the summer of 2016. However, Lovato and Valderrama sparked rumors last year when they were spotted together in multiple places. Could these two be reconciling their celebrity relationship or are they just good friends? We’ll have to be on the look out! These celebrity exes are either on good terms as friends or may be giving their relationship another try. What are some benefits to remaining friends with your ex? Demi Lovato, formerly part of a six year celebrity couple with Wilmer Valderrama, recently shared her relationship advice. According to People.com, Lovato admits to being open to both men and women for a long-term relationship. Lovato’s biggest advice for young people: there’s a lot of life ahead for people, so don’t let past decisions define your current identity. This celebrity news is something we can all take to heart. What are some ways to know if you’re in a healthy relationship? …Looking for love advice? Click to read more! Photo: Guilherme Vasconcelos and Demi Lovato. Courtesy: Instagram. This relationship has ended up a celebrity break-up. What are some ways to know your relationship is done for good? …Do you know when to call it quits with a partner? Click here for more! While there’s plenty of glamorous ways that celebrities shake up their style, a new trend on the move is turning celebrity fashion into fun with a terrific new twist: tassels. That’s right, the newest trend is tassels, and all your favorite stars are jumping on the bandwagon. Whether adding a bit of a funky twist to an otherwise conservative dress or going full fringe to make sure they stand out on any red carpet, these ladies all seem to know a little extra flair never hurt anyone. Check out these stellar looks below and see if this celebrity fashion trend could be the newest staple of your wardrobe too! … Can’t wait to see more? Click here to see some fashion-forward examples of this new celebrity style! Demi Lovato is one of the most supportive girlfriends in Hollywood. The 24-year-old singer was seen cheering on her rumored MMA boyfriend, Guilherme ”Bomba” Vasconcelos, at his match in Los Angeles on Saturday evening. 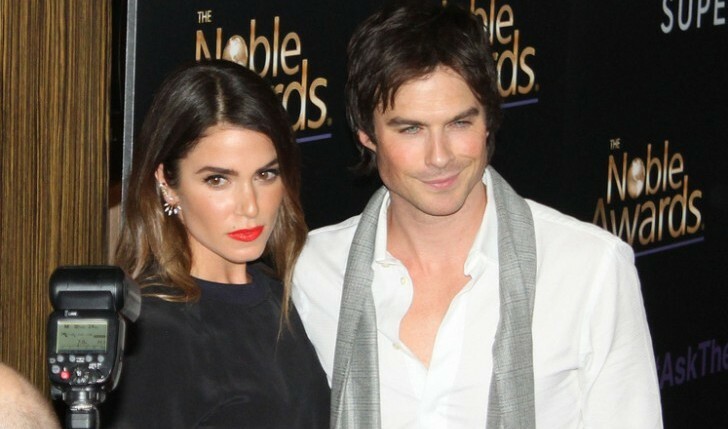 According to EOnline.com, the pair definitely appear to be a celebrity couple with the amount of flirting going on. Lovato wore a “Team Bomba” shirt to the event and pumped up the crowd with a chant for the hunky fighter. Sources told E! that Lovato appeared to be nervous while watching Vasconcelos, and flinched whenever he would get hit. And Lovato’s affections weren’t one-sided. Onlookers said Vasconcelos pointed at Lovato once it was announced he won, and they greeted each other with a kiss. Another witness says they heard Lovato say, “I’m so proud of you! I’m so proud of you,” before they exited the scene. With a celebration like that, it’s no wonder why this new couple is making celebrity news! This celebrity news is pretty convincing! What are some reasons to keep the status of your relationship under wraps? In recent celebrity news, Joe Jonas has given his approval to celebrity ex Demi Lovato’s on-again boyfriend Guilherme ‘Bomba’ Vasconcelos. UsMagazine.com reported that Joe ‘liked’ a pic of Lovato with Vasconcelos on Instagram. Joe and Demi co-starred in the Disney Channel movie Camp Rock and later dated for a few months. 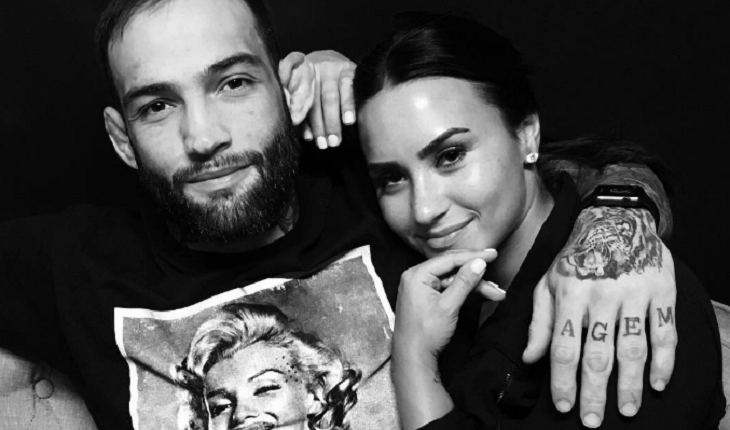 Lovato has recently been in a lot of celebrity relationships, but there seems to be something special between her and Vasconcelos that makes them keep coming back to one another. They both have had relationships in between being with each other and seem to always find their way back to one another. Hopefully this time, it works out for good! This celebrity news proves there’s no animosity between these exes! What are some ways to revert back to friendship with your ex post break-up? A new celebrity couple may be in the making. Demi Lovato recently ended a long term relationship with Wilmer Valderrama, but she seems to be ready to jump back into dating. According to UsMagazine.com, she is ending her summer in a new celebrity relationship with UFC fighter, Luke Rockhold. An insider said, “She’s just trying to have fun right now. They’ve been talking, hanging out and hooking up, and they like each other.” The same source shared that Rockhold has no desire to settle down at this time, and Lovato is happy where their relationship is. It sounds like the perfect end of summer fling that could turn serious! Rumors have it that there’s another celebrity couple in the works. What are some good ways to meet someone with similar interests? …Want to learn more? Click here. Demi Lovato seems to have found “the one.” In celebrity news, Demi Lovato and Wilmer Valderrama are still going strong. According to UsMagazine.com, this celebrity relationship has lasted for six years. Lovato had nothing but good things to say about her man, saying, “When I dated white guys, it wasn’t as passionate as my relationship with Wilmer. Maybe that’s just Wilmer. But I do believe that Latin people are just more expressive, more passionate with their emotions.” She added, “He’s very manly, and he can be stubborn like Latino men can, but he’s protective and he cares so much and loves so hard.” This duo are proving that long-term relationships can last. In celebrity news, Demi Lovato is totally smitten. What are some ways to keep the spark alive in your long-term relationship? 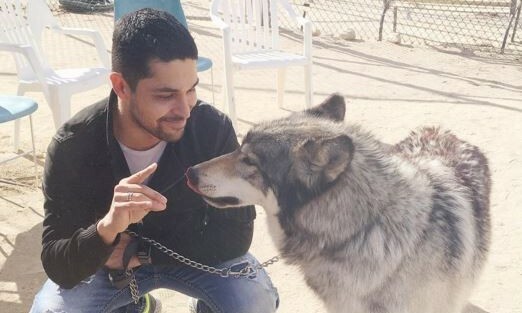 Demi Lovato surprised her celebrity love Wilmer Valderrama with a birthday trip to a wolf sanctuary. According to UsMagazine.com, the celebrity couple spent the day at a wolf sanctuary, and they really enjoyed themselves. This celebrity news is so sweet! The two just recently celebrated their sixth anniversary. This celebrity news makes us jealous for its unique factor! What are some unique ways to make your partner’s birthday special? The latest in celebrity news is a cute one. After a whopping 37 weeks, Wilmer Valderrama managed to get “payback” with his celebrity love, Demi Lovato. On Oct. 20, a brave Valderrama posted a selfie on Instagram that featured a sleeping Lovato at his side! According to People.com, Lovato posted a picture of Valderrama back in February fast asleep on her and this was Valderrama’s payback, many months later. It looks like this celebrity couple knows how to have a bit of fun with one another. We’re sure Lovato isn’t too mad at Valderrama for being brave and posting the sleepy photo. This celebrity news came in the form of payback! What are some ways joking with your partner can make your relationship stronger? According to People.com, Demi Lovato recently reminded everyone to love their curves. And, it may be because of her celebrity love, Wilmer Valderrama. Demi hinted that she and Wilmer have a strong celebrity relationship when she mentioned that “a special someone” taught her how to love her curves on Instagram. This celebrity love is going strong! What are some ways to instill confidence in your partner? Current X Factor judge, Demi Lovato has had her fair share of failed relationships. From Wilmer Valderrama to Joe Jonas, she has realized what she has gone through and is trying to make improvements with her life. She insists that it is unhealthy to devote the entirety of one’s time to a guy. Lovato talks to Cosmo UK, stating how she is in “A place where I can finally trust and love and be a better person for the man I am in a relationship with, instead of being a clingy girlfriend or getting jealous.” As a twenty year-old, she is looking for love. According to UsMagazine.com, Lovato is more than glad with the place she is at in her life. How do you know if you’re in a relationship for the right reasons? How do you keep rumors from affecting your relationship? How do you deal with your man when he freaks out after you catch the bouquet? 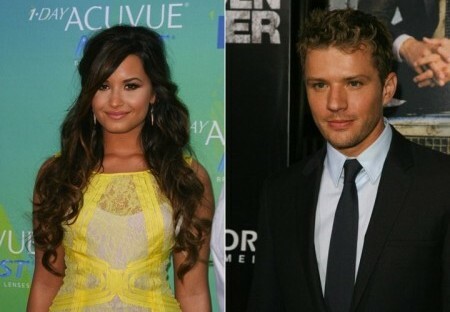 Rumor: Is Demi Lovato Hooking Up With Ryan Phillippe? Following her release from rehab, Demi Lovato has relapsed on an old relationship. 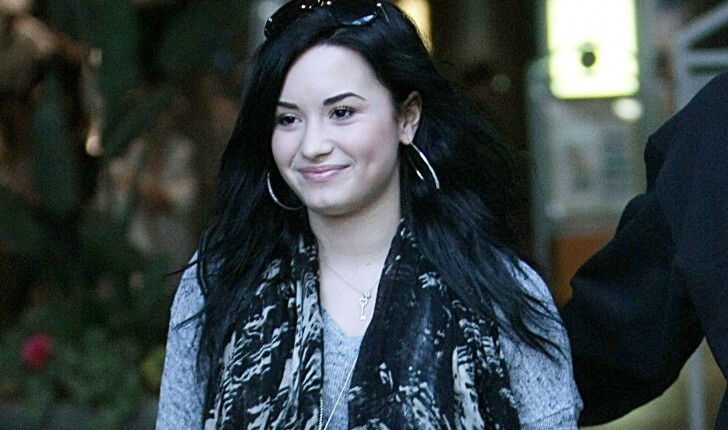 The 18-year-old Disney star was caught with her ex-boyfriend Wilmer Valderrama, according to UsMagazine.com. 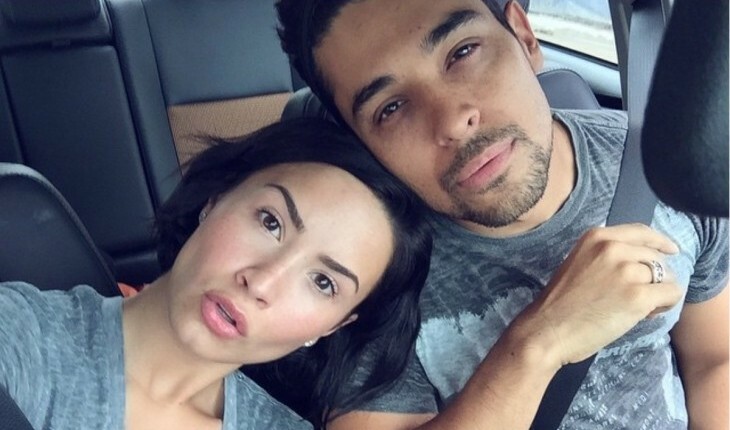 The couple has supposedly been dating since Lovato’s split from Joe Jonas. Lovato checked into rehab back in November after pulling out of the Camp Rock 2 Tour with the Jonas Brothers to “seek medical treatment for emotional and physical issues.” Reports say she has had past issues with weight management and self-mutilation.